The beast glistened in the late afternoon sunshine, still wet from splashing through creeks along the Scenic Rim, a dramatic and incredibly beautiful stretch of volcanic peaks clad in subtropical rainforest in the Gold Coast Hinterland. We were towing the Nugget, a rather comically named but seriously capable camper trailer from Brisbane’s Stoney Creek Campers. With a couple of days cleared from the schedule and the weather on our side, we were stoked to be heading into the scrub in this beautiful part of the world to put the Nugget through its paces. Stoney Creek Campers in the brainchild of Hank Rojek, a veteran of the camper trailer industry. 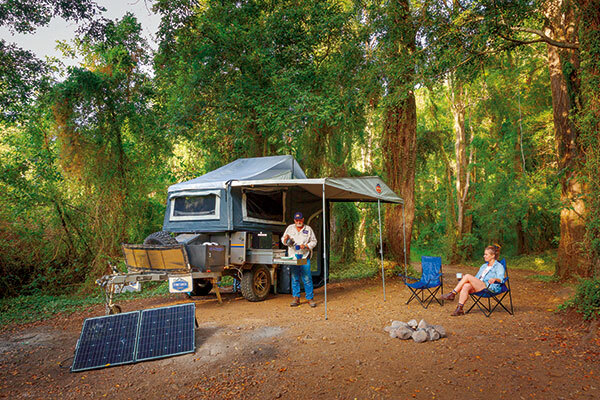 Hank originally started Trackabout Campers – a fellow Brisbane-based manufacturer of soft floor offroad trailers. He sold Trackabout in 2002 (the brand still operates under different management) and launched Stoney Creek in 2012. Together with his son Chris, Hank aims to provide quality products that draw on years of expertise and industry experience, at an affordable price point. To that end, the brand’s trailers are built to Stoney Creek’s specifications in China and assembled in Australia. 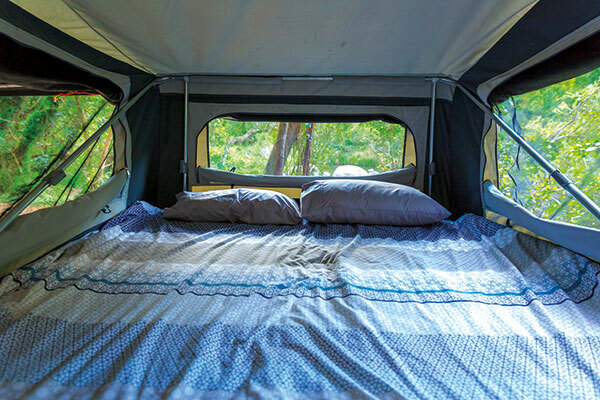 With a product line-up that covers soft floors, hard floors and hybrids, Stoney Creek is a generalist manufacturer with something for every style of camping enthusiast. The Nugget is the most suited to serious offroading. It fits into the increasingly popular compact, boxy, rooftop tent-style trailer made famous by Patriot Campers. It has slight dimensions, high ground clearance and excellent entry and departure angles. It’s light on the scales and has an unpretentious, back-to-basics approach that will appeal to anyone with a taste for exploring behind the beaten track. It’s a pretty basic trailer when it comes to specifications, with a few of the necessary comforts for family camping but plenty of scope for offroad adventure. Like the bloke on your high school rugby team with the same nickname, the Nugget is a chunky little thing. It has an overall length of 4250mm, a width of 1800mm and a height of 1600mm. It weighs 955kg tare, with 450-odd kilos to spare for gear amounting to an ATM of 1400kg. On paper these specifications make the Nugget appear to be the ideal partner out in the bush (not to mention easy to store when you’re back in civilization), but it’s also got the running gear to back it up. 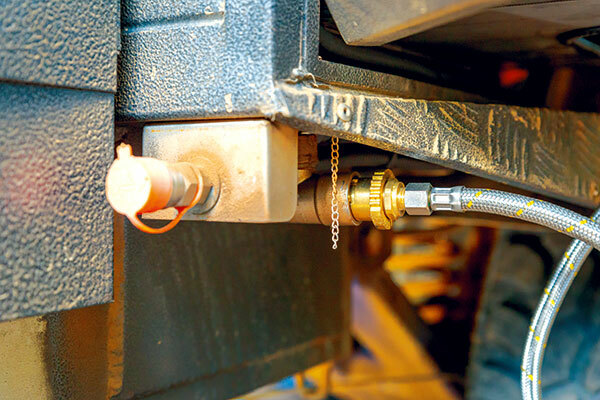 The hot dipped galvanized chassis sits on independent suspension with single shocks and coil springs. It comes with chunky mud terrain tyres as standard, with a drawbar-mounted spare. It connects to your towing vehicle via a poly block-style offroad coupling, and there’s a 10in swing-away jockey wheel. All of this kit means the Nugget is crying out for a 4WD to help it fulfill its potential, but it’s light enough to be towed behind an SUV. After an emphatic string of ‘oohs’ and ‘ahhs’ out the window at the beautiful volcanic landscape, we found some rough and tumble tracks with multiple rocky creek beds to cross. The Nugget lapped it all up with ease. A camper such as the Nugget with limited dimensions must be selective in the niceties it includes. 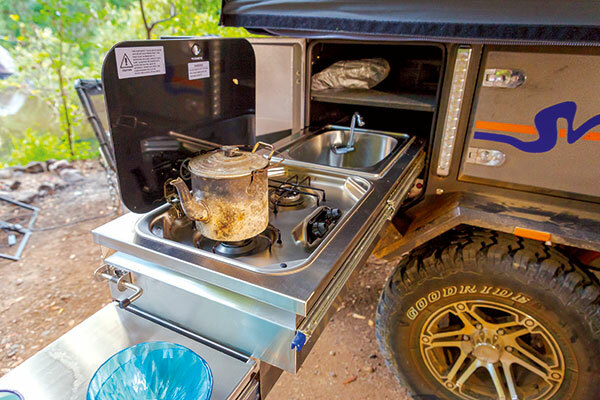 And so, the kitchen is a simple stainless steel drawer with a sink, a two burner gas stove (plumbed internally to the 9kg gas bottle on the drawbar) and a small work area – although I’d wager you’d opt for the camp table to chop your veggies. The bench slides to reveal a cutlery drawer. I found the sink a little fiddly due to the fact the tap is tucked almost into the body of the camper, so manipulating it on and off was a bit of a pain even with my weird tiny hands. This could be resolved if the sink were placed even just an inch away from the internal end of the drawer. There are two compartments at the kitchen with a total of three storage drawers for pantry items and cooking equipment, while the fridge slide is at the rear of the camper (BYO fridge) so, if the camper is set up, you’ll need to venture into the tent to access the fridge. Not ideal but again, limited body size means some concessions must be made. There’s a light bar at torso level at the kitchen, which is the sum total of lighting on the Nugget and is positioned too low to effectively illuminate the kitchen working area. 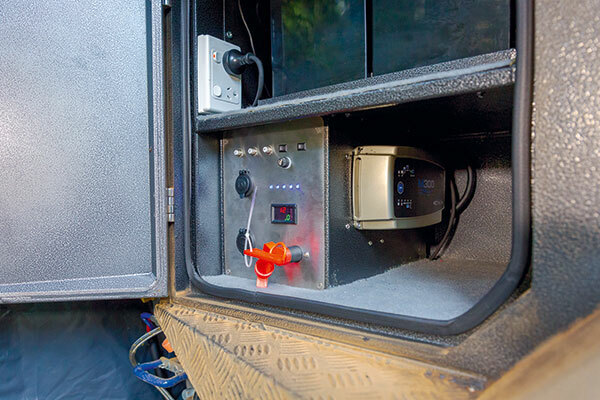 There are now lights inside so you’ll need to BYO 12V LED strip lights, which is not the end of the world but it’d be nice to see a more thoughtful approach to lighting on a camper worth $16,990. The electrical set-up is comprised of two 100Ah deep-cycle batteries with an optional management system and solar capability. The tent is a rear-fold softfloor made from 14oz canvas with large internally opening windows for excellent ventilation. It opens with relative ease for quick stops, but add 20 minutes if you also want to set up the awning. The tent space provides an adequate area for bags and to get changed, and would be big enough for young kids to sleep on a camp mattress. Bigger kids would likely need to bring a swag or a little tent, which to be fair is probably their preference anyway. Who wants to sleep near their parents, after all? The main bed area is large, wider than a queen but with a basic foam mattress. It’s somewhat of an eyrie, towering over the tent at great heights. It’s accessed via a ladder, which could probably do with a redesign as the rungs are narrow and on bare feet, are a bit punishing. In addition to the pantry storage area already discussed, the Nugget has two storage compartments on the driver’s side with available space, while the third compartments houses the electrical set-up. There’s a lockable toolbox on the drawbar, and here you’ll also find space for two jerry cans. The main water storage is a 100L stainless steel tank, mounted underneath and shrouded in checkerplate. A gas hot water system is an optional extra. The Nugget is, overall, a tidy entry level package. 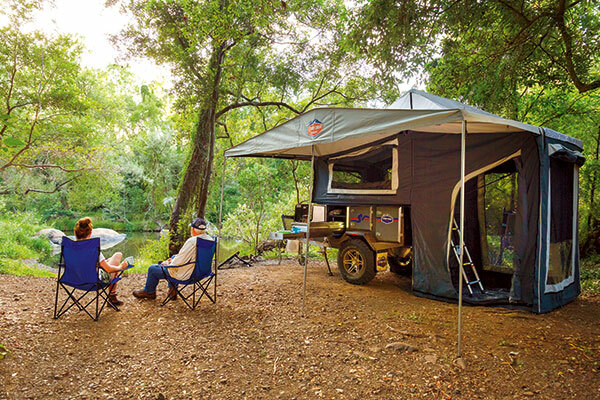 The $16,990 price tag won’t obliterate the bank, and for the price you get a well-engineered and capable offroad camper trailer made by people with years of experience. It requires a little bit of refining with it comes to comfort and usability, but these are small changes that are simple to make. Budget-conscious adventurers with a thirst for simplicity and a desire to expand their horizons and venture across tricky terrain will love the Nugget.